Experiential education at Brevard College seeks to extend the classroom beyond walls. Now, students and faculty have an innovative new way to virtually extend the walls with the addition of the Span Wall from Nureva. The Nureva Wall works in conjunction with Span Workspace software to allow teachers and students to collaborate in real-time. This collaborative solution goes hand-in-hand with Brevard College’s focus on experiential education. Students interact physically with the expansive touchscreen, equivalent in size to a traditional classroom whiteboard. Art History Professor, Dr. Anne Chapin, has embraced the technology for her imagery-rich courses. 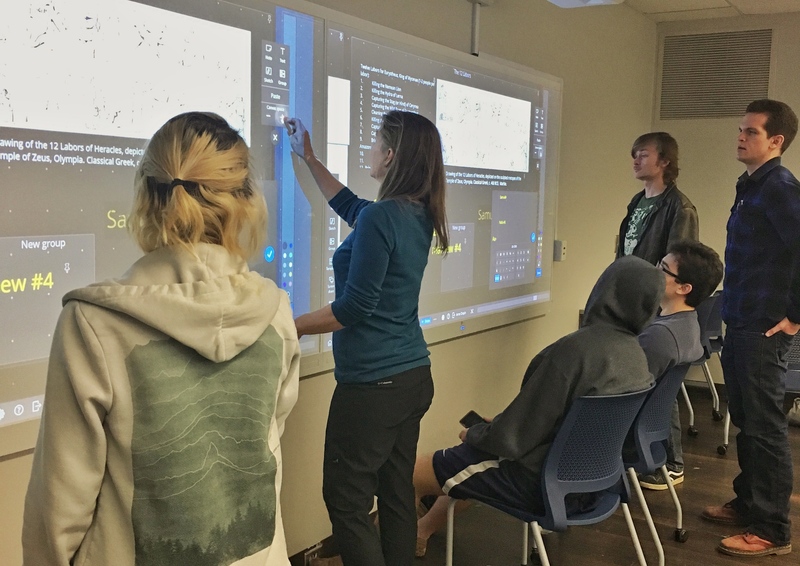 The large, interactive touchscreens in McLarty-Goodson are as unassuming as classic whiteboards until the lights are dimmed and the wall comes to life. In Chapin’s Introduction to Mythology class, students sit in pods with connected TVs and wireless keyboards. These pods allow students to work together and function as an extension of the Span Wall. Then, something surprising happens. In a 2 pm class, sometimes noted for post-lunch drowsiness, students are actively engaged, both mentally and physically with the pace of the class. Students are on their feet, discussing the topics and tapping their chosen material on the Span Wall. Some roll around in their chairs checking in with other groups, helping with the technology. Once all topics are claimed, the teams begin researching their assignment using cell phones, tablets, and laptops. The groups contribute researched content and images to the Span Wall until all the points are ready to be discussed. Student groups then take turns teaching their aspect of the day’s topics. Chapin attentively listens and integrates their presentations into previous course materials. The extensive Span Wall allows participants to scroll through a virtual layout to accurately position the information on the Mythology course timeline. The immediacy of this process excites students. Rather than passively receiving information through lectures, students actively engage with course materials to gain the required knowledge. Nureva’s interactive technology stimulates student participation, ownership over course materials, and teamwork among teachers and classmates. The Span Walls and education-rich software open a new dimension in teacher-student collaboration and experiential education. As Brevard College evolves with the ever-changing landscape of technology, students have the opportunity to practice innovative thinking and Brevard College’s small class size allows students ample opportunity to establish a solid understanding of this state-of-the-art technology.